With Windows 8, Microsoft aims to introduce new idea of what the desktop, laptop and tablet computer should look like. There are some pretty major changes both under the hood and up front for millions of existing Windows users around the globe. The thing is, while some of the changes are sure to be hugely popular with the Windows using masses, there are almost guaranteed to be one or two that have people both seething and confused. Those into their aesthetics will no doubt lament the removal of one of Windows 7’s most loved semi-features – the Aero interface. For the uninitiated, the Aero interface is what gives the application and Explorer windows that transparent border, allowing users to peak through them to see what lurks behind. We love it, you probably love it, but someone somewhere inside Redmond apparently didn’t so it’s been pulled from Windows 8. As usual though, there’s an app that apparently reverses Microsoft’s abomination of a decision. Aero8Tuner is the app in question, and it allows users to change some options hidden inside Windows 8 that bring the Aero interface back to life, at least in a semi-real, rather buggy implementation. But hey, it’s better than nothing! The app itself allows users to change the color of the window’s border, disable coloring and alter color balance as well as activate a high contrast mode that does exactly what you would imagine it to do. Useful, if you use that kind of thing, that’s for sure. There are plenty of other options to play with, too, so the intrepid tinkerer should be able to find the setting to suit their taste in there somewhere. If Aero8Tuner sounds like it might fill a hole for you, then you can download it and give it a try for yourself. The app is free to download, and is available in both 32-bit and 64-bit guises, depending on your particular choice of Windows 8 installation. 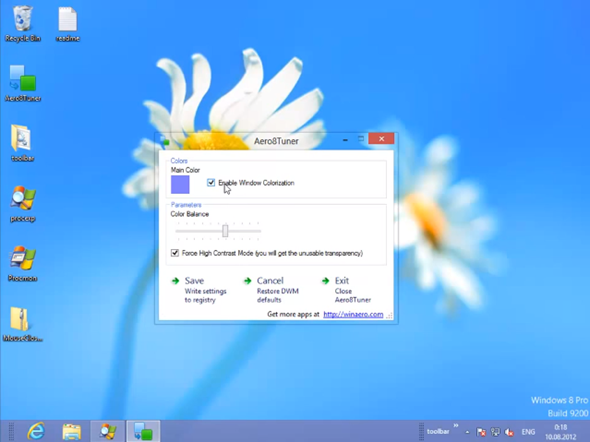 You can download Aero8Tuner for Windows 8 from here.